« What Do You Want Kid? Here’s something we never learned in our high school physics class: the laws of cat physics. A cat at rest will tend to remain at rest, unless acted upon by some outside force - such as the opening of cat food, or a nearby scurrying mouse. A cat will move in a straight line, unless there is a really good reason to change direction. All blue blazers and black sweaters attract cat hair in direct proportion to the darkness of the fabric. More cat physics after the jump. Heat flows from a warmer to a cooler body, except in the case of a cat, in which case all heat flows to the cat. A cat will stretch to a distance proportional to the length of the nap just taken. All cats must sleep with people whenever possible, in a position as uncomfortable for the people involved as is possible for the cat. A cat can make her body long enough to reach just about any counter top that has anything remotely interesting on it. A cat will accelerate at a constant rate, until he gets good and ready to stop. Cats must attend all meals when anything good is served. No rug may remain in its naturally flat state for very long. A cat’s resistance varies in proportion to a human’s desire for her to do something. Cats know that energy can neither be created nor destroyed and will, therefore, use as little energy as possible. Cats also know that energy can only be stored by a lot of napping. If a cat watches a refrigerator long enough, someone will come along and take out something good to eat. Turn on an electric blanket and a cat will jump into bed at the speed of light. A cat will always seek, and usually take over, the most comfortable spot in any given room. All bags and boxes in a given room must contain a cat within the earliest possible nanosecond. A cat’s irritation rises in direct proportion to her embarrassment times the amount of human laughter. A cat will drink his weight in milk, squared, just to show you he can. A cat’s desire to scratch furniture is directly proportional to the cost of the furniture. A cat will always land in the softest place possible. A cat immersed in milk will displace her own volume, minus the amount of milk consumed. A cat’s interest level will vary in inverse proportion to the amount of effort a human expends in trying to interest him. Any pill given to a cat has the potential energy to reach escape velocity. A cat is composed of Matter + Anti-Matter + It Doesn’t Matter. This entry was posted on Thursday, May 24th, 2007 at 1:38 pm	and is filed under Cats, National Dog, Cat & Pet Info, Entertainment About Pets. You can follow any responses to this entry through the RSS 2.0 feed. Both comments and pings are currently closed. Truer words were never written. I especially struggle with the law of rug configuration! The only possible correction I can make to this is the Law of Cat Thermodynamics - heat will flow from a cat to her human if that human is suffering from hot flashes and night sweats. 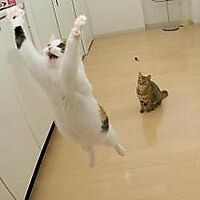 Law of Cat Gravity: Cats are not affected by law of gravity, particularly when frightened.